4 www.coalage.com January/February 2019 leading developments Coal Will Remain Dominant Global Fuel in IEA Forecasts The International Energy Agency (IEA) released their 2018 Coal Mar- ket Report recently with forecasts through 2023. Coal accounts for 27% of total global energy and 38% of global electricity generation, the same market share it held in 1998. In 2017, global coal demand increased by 1% and electricity generation from coal increased by around 3%. 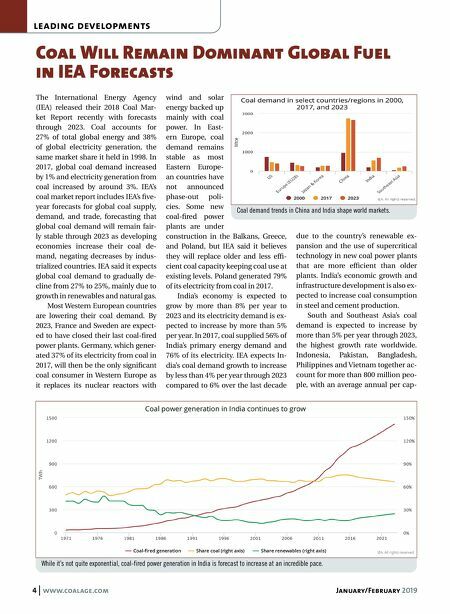 IEA's coal market report includes IEA's five- year forecasts for global coal supply, demand, and trade, forecasting that global coal demand will remain fair- ly stable through 2023 as developing economies increase their coal de- mand, negating decreases by indus- trialized countries. IEA said it expects global coal demand to gradually de- cline from 27% to 25%, mainly due to growth in renewables and natural gas. Most Western European countries are lowering their coal demand. By 2023, France and Sweden are expect- ed to have closed their last coal-fired power plants. Germany, which gener- ated 37% of its electricity from coal in 2017, will then be the only significant coal consumer in Western Europe as it replaces its nuclear reactors with wind and solar energy backed up mainly with coal power. In East- ern Europe, coal demand remains stable as most Eastern Europe- an countries have not announced phase-out poli- cies. Some new coal-fired power plants are under construction in the Balkans, Greece, and Poland, but IEA said it believes they will replace older and less effi- cient coal capacity keeping coal use at existing levels. Poland generated 79% of its electricity from coal in 2017. India's economy is expected to grow by more than 8% per year to 2023 and its electricity demand is ex- pected to increase by more than 5% per year. In 2017, coal supplied 56% of India's primary energy demand and 76% of its electricity. IEA expects In- dia's coal demand growth to increase by less than 4% per year through 2023 compared to 6% over the last decade due to the country's renewable ex- pansion and the use of supercritical technology in new coal power plants that are more efficient than older plants. India's economic growth and infrastructure development is also ex- pected to increase coal consumption in steel and cement production. South and Southeast Asia's coal demand is expected to increase by more than 5% per year through 2023, the highest growth rate worldwide. Indonesia, Pakistan, Bangladesh, Philippines and Vietnam together ac- count for more than 800 million peo- ple, with an average annual per cap- While it's not quite exponential, coal-fired power generation in India is forecast to increase at an incredible pace. Coal demand trends in China and India shape world markets.